There is no getting away from the fact that most people in Britain share a hard-headed view of baseball. They see it as a game played solely by Americans and of little relevance to the UK’s sporting past or present, aside from the idea that ‘we invented it and called it rounders’. The existence of a professional baseball league in Britain in 1890 would come as a great surprise to those doubters. Indeed, it would probably be a surprise to some British baseball fans too. 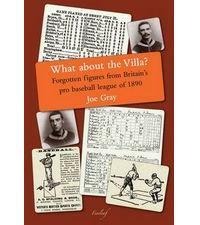 ‘What about the Villa?’ chronicles this fascinating chapter in British baseball and sporting history. It is the first book by Joe Gray, founder of the Project for the Chronicling of British Baseball (Project Cobb). Joe is also a valued contributor to BaseballGB, but no personal bias is needed to admire the achievement of producing this book and to enjoy its contents. The book covers all aspects of the league in impressive detail. This begins with a useful guide to how baseball was played in 1890 and goes on to investigate the sport’s early links with Britain, how a professional league came to be formed in 1890, who was involved in the league, how the competition played out and the league’s legacy. There were four teams in Britain’s first pro baseball league: Derby, Preston, Stoke and Birmingham’s Aston Villa. The Aston Villa name is synonymous with football and ‘What about the Villa?’ shows this was an important link with the 1890 league and partly how it came about. Roger Kahn’s use of the Dylan Thomas phrase ‘boys of summer’ to describe the Brooklyn Dodgers has come to be used as a reference for all baseball players. It’s a phrase that carries particular weight with the efforts of the people involved in the 1890 British league. The largely football-free summer months created a gaping void for those who wanted an alternative to cricket (and, in some cases, an addition to cricket). Gray states that “Aston Villa’s baseball team was founded in part as a means of keeping association footballers fit in the summer”, adding “it is amusing to note, then, that Aston Villa Football Club was established 16 years earlier as a way to occupy cricketers during the winter months”. Not only did some of the players come from other sports, league officials (the president of the Aston Villa baseball team was William McGregor, who has been labelled as the “father of the Football League”) and the working classes who paid to watch the games were often already part of the British sporting community. ‘What about the Villa?’ is therefore not simply a baseball book on its own, but a detailed look at one aspect of the wider development of professional sport in Britain and how it was perceived by newspapers and local communities. The coverage that the league received is one of the key reasons why the story can now be presented. A British professional baseball league in 1890 may sound like a random curiosity and it is remarkable that records of the games have survived for over 120 years. The reference list at the end of each chapter shows that the story of the league was not neatly packaged and required a considerable amount of meticulous research, not least through the archives of the local papers of the four teams. If one achievement stands out it’s the collation and presentation of box scores for the vast majority of the games played. Baseball fans have lovingly studied the contents of box scores for over a century and being able to do so for British pro baseball games from 1890 is a real treat. And Britain’s baseball history does not only survive on paper and microfilm. It is noted in the Epilogue that the Derby Museum and Art Gallery holds several artefacts from 1890s baseball, including a facemask believed to have been used in the 1890 league. Thankfully the rumours that legendary football manager Brian Clough ordered their destruction alongside the rest of Derby County’s mementoes when he took over in the 1960s turned out not be true. Sadly the records that remain are not there to chart the beginning of a continuous story of baseballing prosperity. You don’t need to read this book to know that the 1890 pro league did not lead to a long-standing professional baseball structure in Britain. The league didn’t continue in a formal, structured way after the 1890 season and the fortunes of the sport have ebbed and flowed ever since, with periods of progress and optimism fading out all too quickly. Some of the problems faced in 1890 have stayed with the sport ever since: disputes over imported talent, disagreements within the ruling ranks dominated by personal interests, and seasons undermined by teams withdrawing partway through. Maybe there were just too many obstacles in the way for baseball to become a major sport in Britain in the 1890s, and maybe there still are. Yet every page of ‘What about the Villa?’ serves as a rallying cry to anyone in Britain that appreciates the sport. Against all the odds – not to mention the preconceptions of many – baseball was played, watched, enjoyed and obsessed over by a section of Brits in 1890, just as it has been ever since and continues to be today. We wouldn’t be able to appreciate this without the dedicated research that has gone into ‘What about the Villa?’. It makes for a fascinating history of a little known period. Alongside Josh Chetwynd and Brian A. Belton’s ‘British Baseball and the West Ham Club’, it’s an essential purchase for anyone interested in Britain’s baseball heritage and, more generally, Britain’s sporting culture during the late nineteenth century. Hopefully it will also inspire further research on Britain’s baseball past, which can in turn underpin the sport’s efforts to be a part of Britain’s sporting future. Have you read “What about the Villa”? Feel free to share your thoughts in the comments section below. Can you recommend any other similar books? If so, let us know. Matt – I thoroughly enjoyed reading this. It’s really good to experience your reviewing style from the perspective of the author. You got me thinking again about my book, in a very good way. And you somehow manage to crystallize elements that were perhaps more an artefact than an intention. Your review is very thoughtfully written indeed. For anyone into signed copies, I’ve just put five up on ebay: http://cgi.ebay.co.uk/What-Villa-Joe-Gray-signed-new-copy-/280658013768?pt=Non_Fiction&hash=item4158856e48#ht_500wt_1156. The Fine Leaf publishing website now seems to be a site for women’s clothing. I will download the pdf version of the book for now but would still be interested in a paper copy if there is one out there.